Galaxy Compact Wall Mount | ICWUSA.com Inc. The Galaxy 170 extends just 4″ (10 cm) from the wall while allowing your LCD a small range of tilt and pivot. The Galaxy 270 reaches 9″ (22.86 cm) from the wall when extended. Its compact ball joint enables your monitor to tilt and swivel. 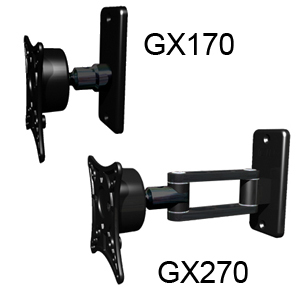 These mounts can also be mounted to a wall track.